Acoustic panels have a wide range of indoor applications such as wall and ceiling panels, exhibition booth construction and separating wall elements. These panels are the best solution for applications where insulation, acoustic performance, durability and design are required. Distance and width between grooves allow the panels to absorb noise and create a healthy, pleasant and more peaceful environment. Panels are ready for use, easily mounted and environmentally friendly. 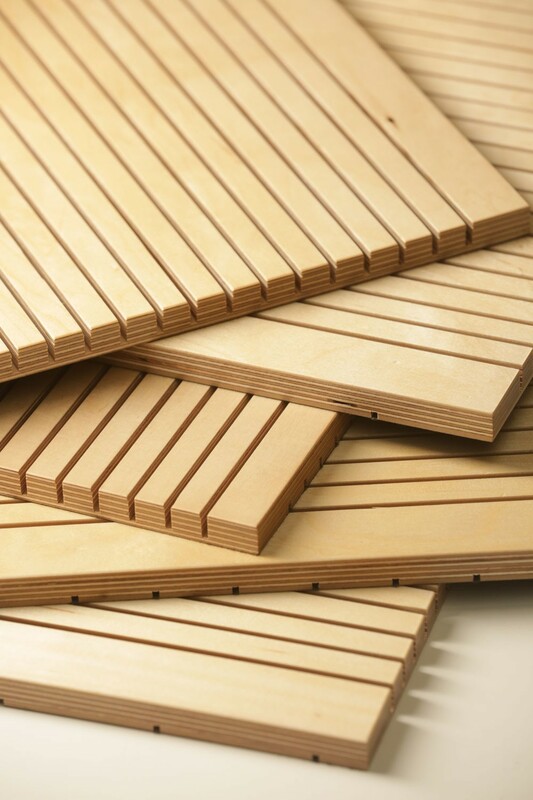 Birch plywood – raw birch plywood, birch plywood veneered on one or on both faces, lacquered birch plywood, Fire retardant birch plywood are recommended as basic material for acoustic panels. Panels are mechanically processed by grooving with a distance of 16 mm and width 4 mm on the decorative face of panel, and with a distance of 16, 32 or 64 mm on the reverse face of panel. According to customer’s requirements panels can be machined and treated: T&G, cut-to-size, drilled, milled, lacquered, treated with fire retardant material and a nonwoven fabric can be glued on the reverse face of the panel. Plywood is glued with waterproof phenol formaldehyde resin adhesive. The weather and boiling water resistant bonding meets the requirements of the following standards: EN 314 / 3rd class; BS 1203 / H 4 (previously WBP); DIN 68705 Part 3 / type BFU 100. In accordance with the standard EN 13986 the formaldehyde emission meets the Class E1 requirements (test method EN 717 Part 2). plywood glued with phenol-formaldehyde resins meets the CARB Phase 2 and Japanese 4-Star Regulation’s requirements and Finnish Emission Classification of Building Materials M1.